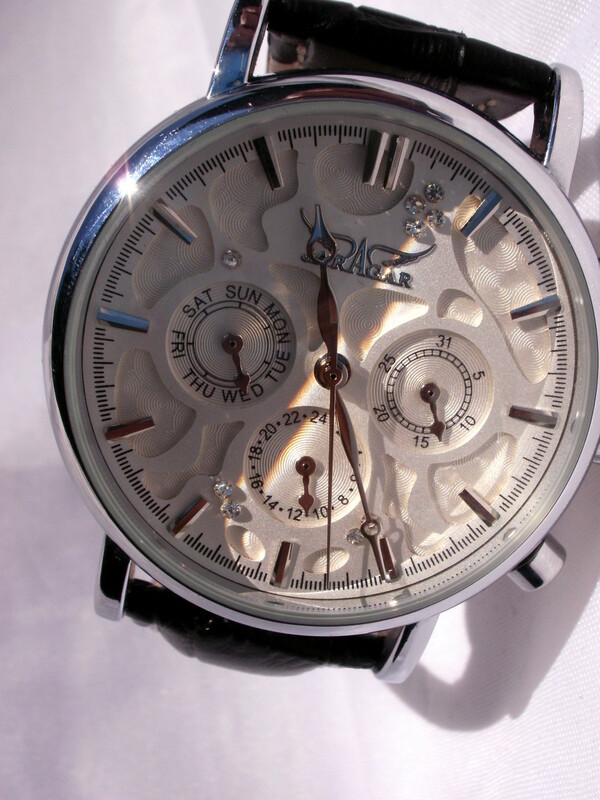 I purchased this watch from Wish.com. It was priced at fifteen dollars and arrived well packaged and ahead of schedule. This chubby little timepiece measures 14mm in thickness and, including the crown, is 43mm across. Dial width is 37mm. The Jaragar weights in at 64 grams which equals 2.27 ounces. The case is either composed of or plated with stainless steel. Two push buttons and a crown jut from the right edge. The dial is protected by a slightly convex sheet of hardened mineral glass. This automatic watch utilizes a dual layer dial. The upper surface is partially cut away, allowing a view of a nicely engraved bottom layer. Nine drystal diamonds are attached to the dial to enhance styling. Before you look it up, I’ll tell you; drystal diamonds are synthetic. The hours are marked with silver studs, matching the color of the timepiece’s hands. Other color variations are available. The left sub dial displays the days of the week and can be adjusted using the lower push button. The right sub dial is numbered 1 through 31 to indicate the day of the month. The upper push button is used to adjust this indication. 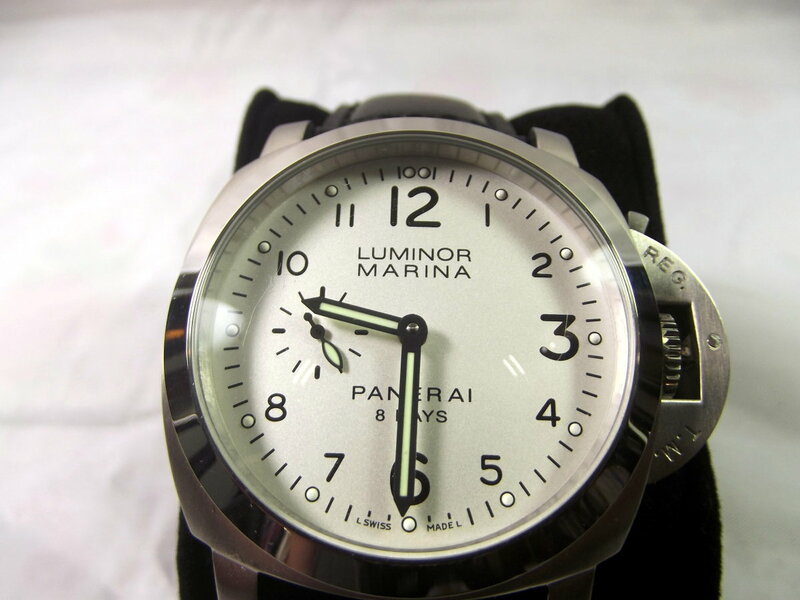 At the bottom, a third sub dial is utilized as a twenty-four-hour clock. A clear window at the bottom of this timepiece allows a view of the watch’s inner workings. 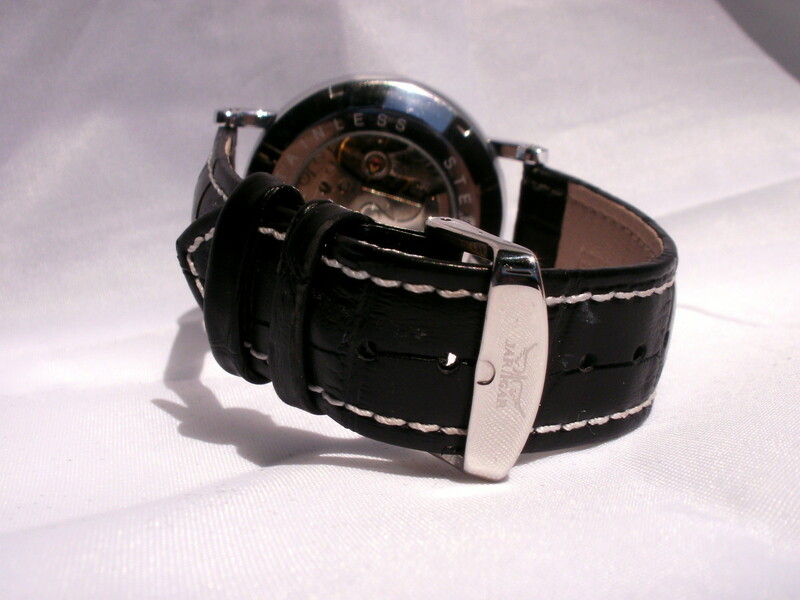 The included watchstrap is 20mm in width and composed of medium quality PU leather. It should last several months. Water resistance is rated 3 Bar. This means the watch is splash resistant only. I appreciate the effect produced by incorporating a two-layer dial but I’m less enamored with the assortment of fake diamonds. I will admit, though; those jewels reflected the light quite effectively during my photoshoot. I opted for the model featuring silver hands and marking studs. I felt this coloring to be the more sophisticated choice. 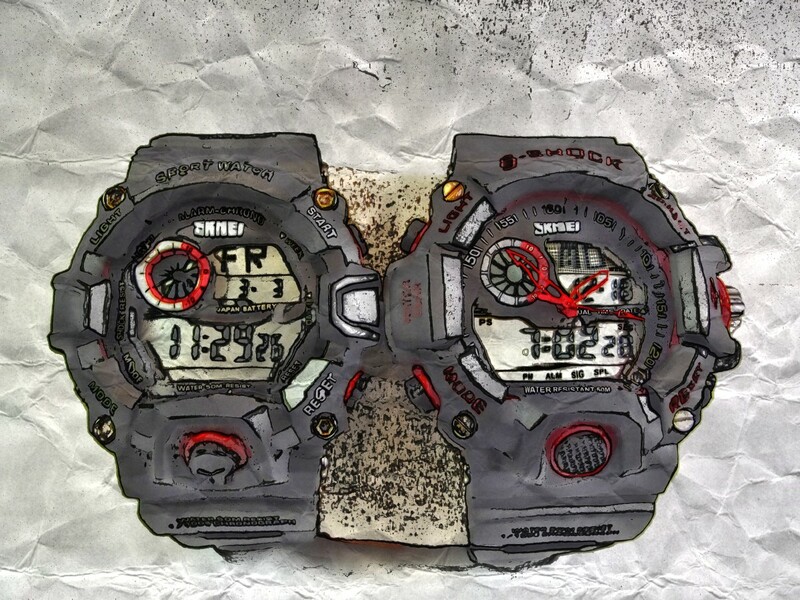 Unfortunately, it proved difficult to pick out the hands against the white background of the dial. 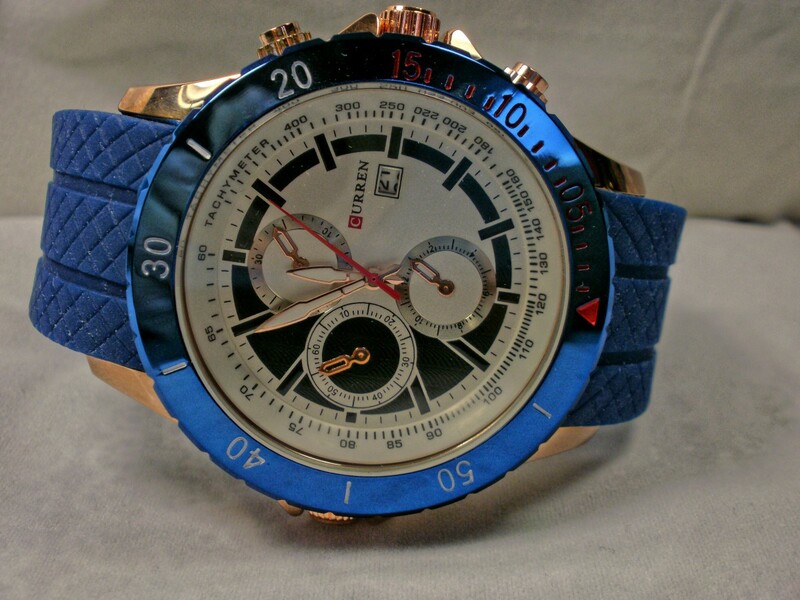 If I were to purchase another of these watches, I would select the timepiece featuring red accents. A transparent window protects the case-back of this watch, allowing a clear view of the movement. 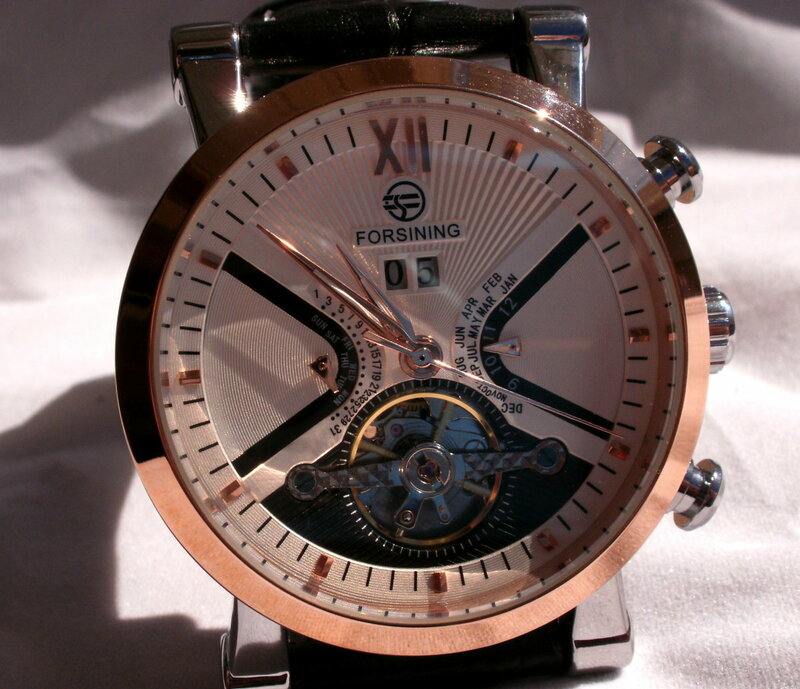 On more expensive watches manufacturers will engrave a fancy pattern onto the rotor and include the brand name. Jaragar did neither. The most notable feature of this rotor is a nasty smudge; probably a fingerprint. This calls into question, the wisdom behind Jaragar’s decision to incorporate a transparent case-back. I placed this watch inside my Diplomat watch winder for a period of four days. During this time the three sub dials worked perfectly. To my disappointment, however, this timepiece gained an average of 42 seconds per day. It all comes down to priorities. The JJS008 is loaded with features but, in order to keep the price low, quality control suffers. 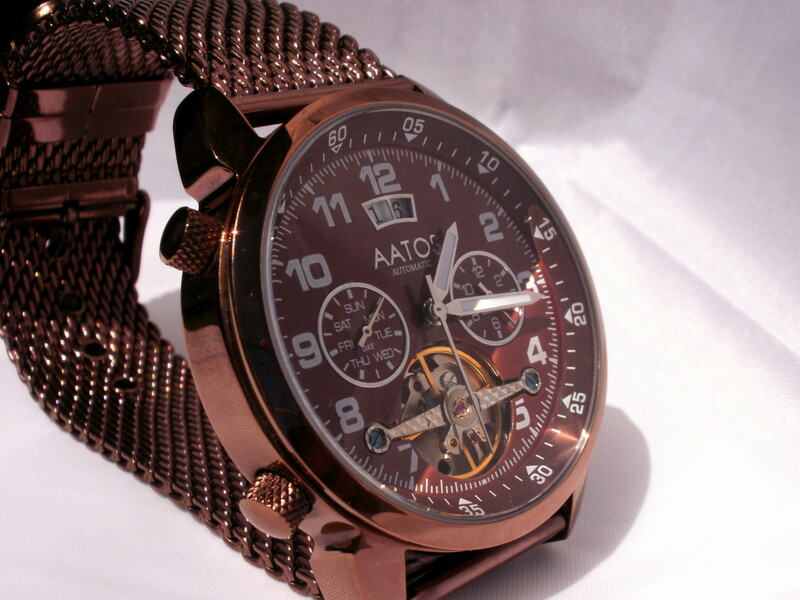 An automatic watch is wound as a by-product of the wearer’s movement. The rotor, which is part of the winding mechanism, swings back and forth, rotating a cog which winds the main spring. 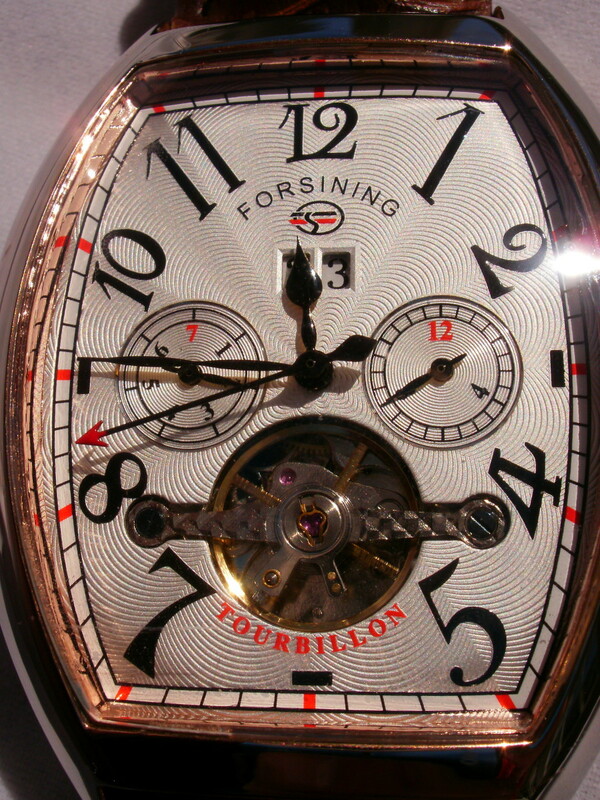 On more expensive timepieces the rotor will rotate a cog each time it swings—whether it be forwards or backwards. 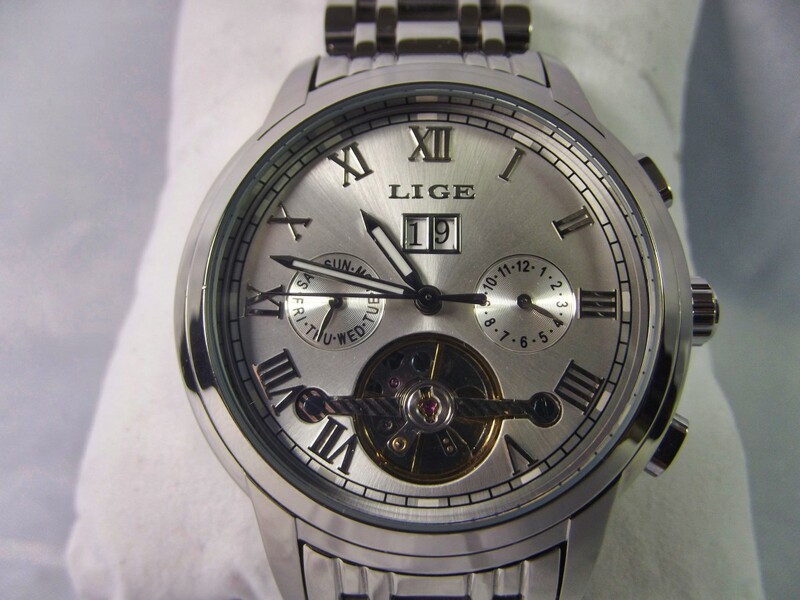 On less expensive watches, such as this one, the mainspring is wound incrementally every second swing. Because I am not particularly active, I found this winding action was not always sufficient to keep the watch running all night. The fix is easy. I simply wind the timepiece by rotating the crown three or four turns each night before I go to bed. If you require improved accuracy, check out my review of this watch's big brother, the Jaragar JR13. In appearance, this watch arouses confidence. 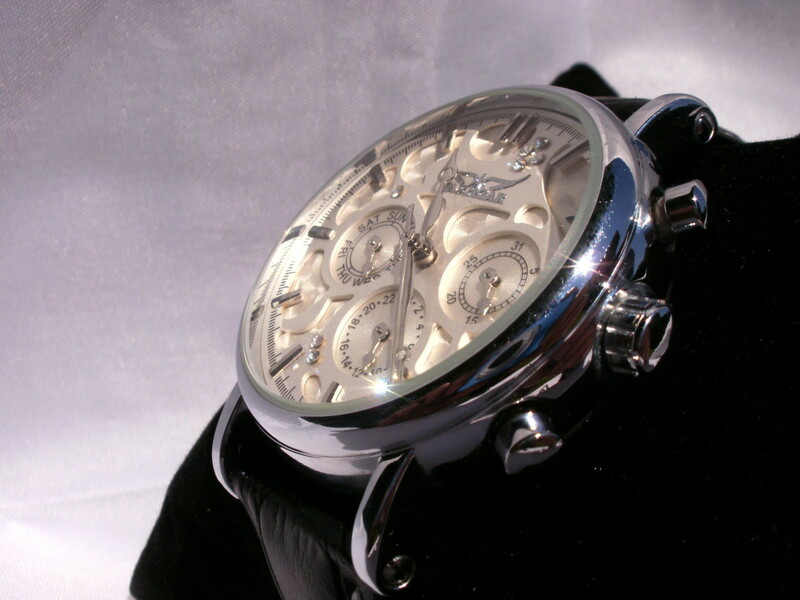 It is reasonably heavy for its size and enclosed within a solid stainless steel case. The push buttons function well and the crown adjusts the time without noticeable sloppiness. 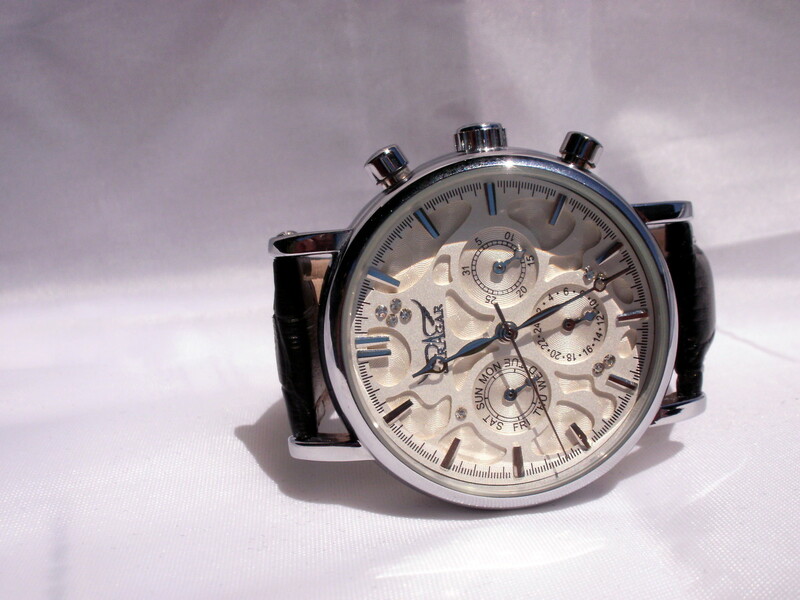 The Jaragar’s watchstrap is composed of medium quality PU leather and should last for several months. 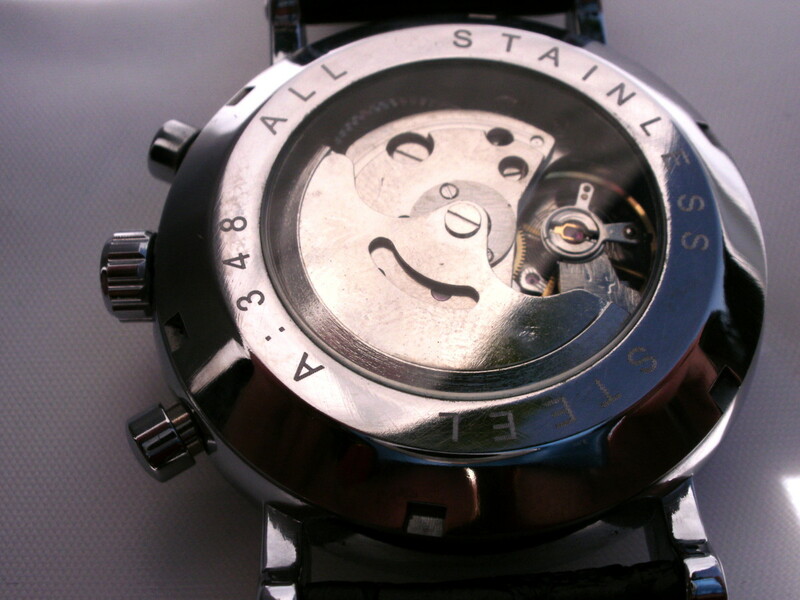 Automatic watches require routine maintenance—cleaning and lubrication—every three to five years. If not properly maintain, accuracy will decline and eventually the movement will come to a halt. Normally, fifteen dollar watches do not warrant maintenance. This watch is probably not constructed using high grade components and quality control is suspect. In my judgement, this timepiece will run well for one to two years. 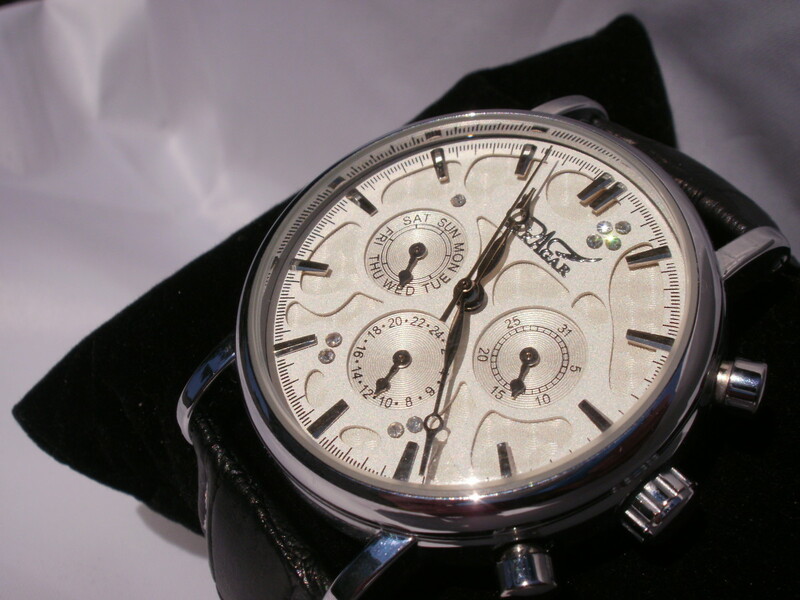 The Jaragar JJS008 is an attractive automatic watch with several useful features. Accuracy is below standard but, if you are willing to spend a few seconds adjusting the time every couple of days, you might consider this watch a worthwhile investment. Although not everyone will admit this, style is the most important consideration when purchasing a new watch. If the timepiece fails to arouse passion, it will gather dust on a shelf. Other factors either enhance or diminish a potential purchaser’s enthusiasm for a watch and, when it comes to the less expensive models, manufacturers must carefully gauge their customer’s preference. Then they design a watch that caters to their desire. Watch reviewers find this information useful as well. Please fill in the survey provided below. Putting aside visual appeal, what do you most look for when purchasing an inexpensive watch? Additional functions such as day and date. Walter, once again, another excellent watch review. Thank you. Thanks for your comment, Jace Quintos. I have edited my article to reflect the information you have provided. I bought one because of this article. Unfortunately after opening the case i discovered that it is not "all-stainless steel" . It's just plated just like the other cheap ones. It would have been okay had the manufacturer been honest about the case material. The watch still looks nice though, so no regret on the purchase.